« Why Do You Choose Open Source? 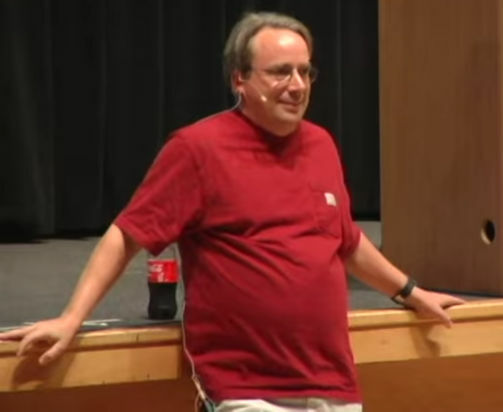 A little over two-and-a-half years ago, Linus Torvalds spent over an hour taking and answering questions from an audience of developers at DebConf14 in Portland, Oregon. Some of what he said is by now old news, but that’s interesting too, as it serves as a marker for where we’ve been. Usually when you see Linus Torvalds speaking at a conference, it’s in the form of an interview, with the interviewer more likely than not being his old friend Dirk Hohndel of VMware. Very famously, Torvalds “doesn’t do speeches.” However, back in August, 2014, he took another tack, which he sometimes does, and submitted himself to answering questions from the audience at the Debian developer conference, DebConf14, in Portland, Oregon. He says a lot of things we already know in this Q&A session. Like a lot of us, on his own machines, he sees the operating system as a means to an end and doesn’t like to spend time putzing around on the OS level. In other words, he wants something that just works out-of-the-box. He also gets asked — and answers — questions about his behavior towards coworkers on the Linux project, which many think to be overly “abrasive.” He would rather we just let Linus be Linus, of course, although the audience seems to be of another mindset. One thing we notice watching this session is how quickly things are changing in the Linux world. Early in the session, Torvalds talks about one of his pet peeves with desktop Linux, that being package management and the difficulty software vendors have distributing Linux ports across all distros. These days, that problem might be on the way out the door. Just this morning, we saw a news item touting the fact that — for better or worse — starting with version 5.10, KDE Plasma will include support for Snaps and Flatpaks. Anyway, sit back, relax and enjoy. Watching Torvalds, we think, is always fun. In other news, Survivors have been found after the sinking of the Titanic. There was a disaster at the landing strip, for the airship Hindenburg. World War II has officially ended, Japan surrenders. “Usually when you see Linux Torvalds speaking at a conference,…”, he spells his name as LINUS. Actually, he spells it as “Linus”. @jimmike Thanks for the copy editing! Fixed. This a good meeting for both. Linus is an authoritarian figure when it comes to his running his kernel project, but the Debian guys are used to working in an elective body with politics playing a role in the way the project makes decision. Both can learn from each other.